Fit: When Talent and Intelligence Just Won't Cut It answers the fundamental performance questions that people have asked for generations. Why is that some individuals are consistently high performers, how do they keep performing in varying situations, organisations and contexts, why can some people just not seem to be able to crack that code, and why do some individuals perform exceptionally well in certain organisations but not in others? This fresh new book challenges current thinking about the war for talent and the role intelligence plays in high performance sport and business. Over 3,000 profiles of elite corporate managers and professional elites have been studied to find the answers as to why certain individuals consistently get exceptional results and why great talent doesn't transfer across teams and businesses. Fit considers real live cases and well-known examples of spectacular successes and failures through the lens of the Hogan Personality Tools. This shows how elite performance is dependent on three things; understanding what role your behaviours are best suited to, what culture you perform your best in and how you're likely to derail your career. Armed with this knowledge, this innovative text allows you to connect the dots on your past performances and prepares you to find roles, organisations and teams which best fit you - opening the door for elite performance. Instead of talent management and changing behaviour, look to Fit as a key to your performance improvement. You'll find that performance does not have a one-size-fits-all formula - it is bespoke, personal and different for each individual. Discover that true success is not totally dependent on talent and intelligence, but on discovering what you're good at and where you fit. 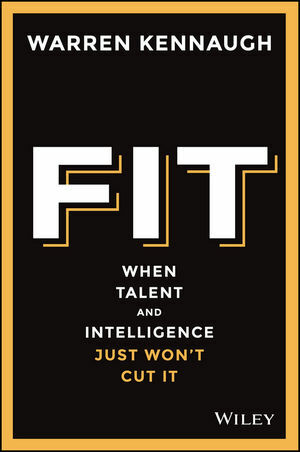 Fit: When Talent and Intelligence Just Won't Cut It unearths the hidden traits of elite performance and enables you to find your fit to further enhance your engagement and success. WARREN KENNAUGH is a behavioural strategist specialising in the identification and development of elite performance. He has profiled over 3000 world class professional athletes and elite business professionals and is regularly called on to share his insights and experience with sports officials, senior executives, major sports bodies, and multi-national corporations.